The blueberry is a blue-coloured, small, round berry, which has a sweet albeit acidic taste. It has a silver bloom around, and transforms from green to reddish purple and finally blue as it matures. The glycemic index of blueberry is 53 which falls under low GI category and the glycemic load of ½ cup of blueberry is 7.2 which also comes under low GL range. These tiny berries is loaded with innumerous health benefits. Blueberries are extremely rich in phytochemicals such as polyphenols. Among all fruits and vegetables, blueberries have the highest antioxidant potential. The significant amount of anthocyanins in berries imparts blue, purple and red colour to them. While blueberries are used popularly in most countries as a part of their cuisine, they offer maximum benefits when eaten raw. Is blueberries safe for diabetics? The glycemic load of ½ cup of blueberries is 7.2 (low GL range) which makes blueberries an ideal option to be included in the diabetic menu plan. 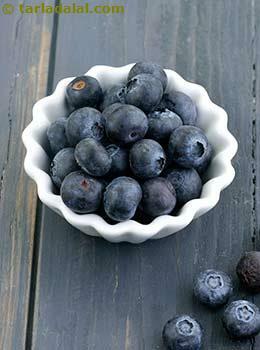 ½ cup of blueberries provides around 13.6 grams of carbohydrates. Since it is recommended to include not more than 15 grams of carbs per serving, blueberries fit into the criteria. Overall 45 to 60 grams of carbs is advised per meal. Because of the low GL, blueberries have a positive impact on your blood sugar levels and do not spike up instantly. The fiber content (2.2g in ½ cup) in blueberries helps in slow absorption of nutrients and thus manages your blood sugar levels. The regular consumption of blueberries helps to prevent cardiovascular diseases due to the antioxidants present within it which is known to reduce the oxidative stress- the major cause of heart diseases. Is blueberries suitable for weight loss? ½ cup of blueberries provides around 54 calories which perfectly fits into the weight loss diet plan. The fiber content in ½ cup is 2.2 grams. Fiber in the body remains undigested in the gut and takes time to absorb nutrients and releases slowly into the bloodstream. Thus increases your satiety levels and helps in controlling the appetite. Try to replace your high calorie fried snack with a handful of blueberries.